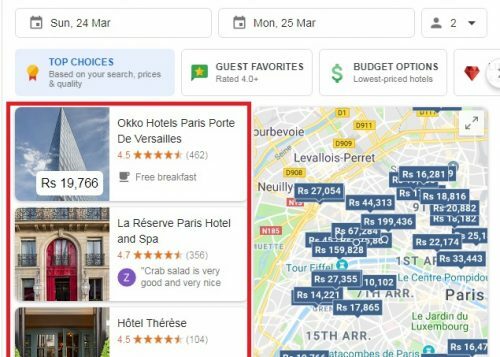 In a grand attempt to overtake hotel booking giants like Booking.com and Kayak, Google rolled out its very own flagship booking platform similar to Google flights ― Google Hotels. Built on the same algorithms Google flight works on, it provides extra functionality compared to its competitor websites. Many believe that it’s destined to be to the go-to service for booking hotels in the imminent future. In this article, we’ll throw light on Google Hotel’s features and what raises it among the common herd. We’ll also walk you through the process of booking hotels through this platform. Google Hotels is coupled with the world’s best search engine to provide you with a flurry of results with lighting fast accuracy and preciseness. Because of this, it’s bound to sweep aside rival booking websites and stand on a league of its own. 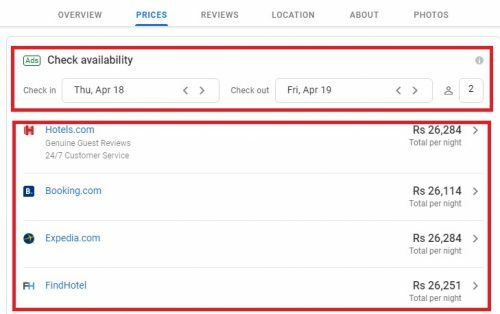 The most recent update to the Google hotels search was the addition of a deals feature. This feature allows users to highlight and filter hotels that offer a discounted room price. It was introduced in a bid to sift and keep track of cheap hotels and help users review basic amenities, such as Wi-Fi and Netflix before making any hasty decisions. 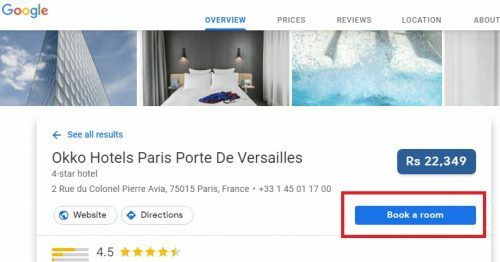 With the arrival of this feature, you can also book directly from Google. It has removed the need to visit the Hotel’s website directly for bookings, making the entire process as convenient as it can be for the user. One other feature that makes Google hotels such an effective service is the “find hotels near important locations” feature. Due to its integration with Google maps, Google hotels lets you search hotels near your locations of interest. For instance, if you’re visiting Paris and want a hotel near the Eiffel tower, it will show you all the available restaurants in and around that area. 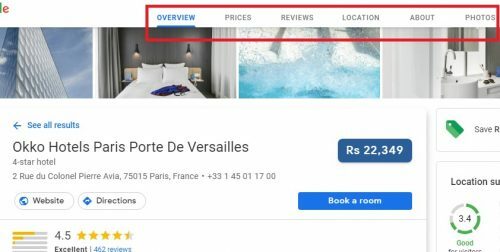 All you have to do is type the keywords “Find Hotels near the Eiffel Tower” and an updated list of pertinent hotels, with their prices, walking and driving distances and other specifications will appear before you. Note: Before using Google Hotels, please make sure that you are signed in to your Gmail account. 1. Go to Google.com and search for your hotel. For example: If I’m searching for Hotels in Paris, I’ll type the keyword: Hotels in Paris. 2. A list of hotels, with Google’s suggested top choices will appear on your screen like this. Select a hotel of your choice from this list. Once you select a hotel, you can check its availability, user reviews, you can visit its website to get further information and even get directions from the tabs on top of its name in the next window. 3. Next, Click Book a Room. 4. Now, select the number of guests and dates you want to check in and check out and their availability. After that, select a booking website, from which you want to book your room, from the list of services and their prices, given below. 5. You will be redirected to the host booking website, where you’ll finally provide your billing information. Note: You can now book directly through Google Hotels. There is no need to first visit a host booking website if you’re signed in to your Google account. However, this feature is slowly rolling out and isn’t yet available for hotels in France. How can I hotel owners avail the Google Hotel service? You can add your hotel by opening Google maps on your phone or desktop and then zooming into the location you want your hotel added. For a detailed guide, please visit the homepage of Google hotels. What is the difference between Google Hotels and Google Hotel Ads? Both are essentially the same thing and give you the options to book a hotel room for your next trip. If you still have any further questions, please just comment below and we will get back to you ASAP.